Beat the heat with mositure control. Crafted from Dr-Fit fabric, this sport shirt keeps you cool and dry. Self-fabric collar, three-button placket and open hemmed sleeves. Nike Swoosh logo on left sleeve A layer of comfort and protection on the green or anywhere the sun is out in full force. This special Dri-FIT fabric wicks perspiration away from the skin while shielding it from ultraviolet rays with 30 UPF protection. 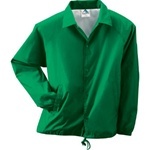 GILDAN SERVER T-SHIRT WITH NO LOGO...$3.60 Augusta nylon coaches jacket, lined with 100% polyester brushed tricot. Snap front, raglan sleeves, reinforced slash front pockets, elastic cuffs and open bottom with drawstring.